In this 2019 ITMA year, Benninger is celebrating its 160th anniversary, which stands for 160 years of commitment to textiles, as well as of responsibility towards sustainable textile production. At this year’s ITMA, which takes place in June in Barcelona, the company will be presenting its latest developments. These include the Benninger-Küsters CPB dyeing centre for knitwear and woven fabrics, the Tempacta washing steamer for knitted fabrics with freshwater supply that is controlled by the degree of contamination, the Trikoflex drum washing machine that is available up to a working width of 5400 mm, as well as Benninger – Küsters Multipad, the new development for complex impregnation tasks on woven fabrics and knitwear with electronically monitored, automatic lubrication. Salt-free dyeing without the use of energy is only possible using the cold pad batch (CPB) dyeing process. This process is also becoming increasingly popular in tropical and subtropical regions, which is reason enough for Benninger-Küsters to adapt the CPB systems even more effectively to the climatic conditions. “The heart of our CPB system is the Benninger Küsters Dypad, which we will also be presenting again this year at the ITMA Barcelona. Benninger is the only textile machine manufacturer with the know-how of the original S-roller technology, which is synonymous with an even dyeing result across the entire fabric width,” the company explains. The Tempacta washing steamer has been especially developed for all low-tension washing processes and is mainly used for diffusion washing. The unit has a consistent counterflow water supply. Online measurement of the degree of contamination regulates the necessary amount of fresh water in order to guarantee the lowest possible water and energy consumption and ensure a high reproducibility of the washing result. The Trikoflex drum washing compartment has the highest mechanical washing efficiency thanks to the double drum technology and the front and back washing technology, according to the manufacturer. Crease-free fabric transport is guaranteed, even with sensitive fabric. In addition, Benninger has developed a cylindrical expanding roller for particularly sensitive textiles for wet and steam applications. The washing compartment is rounded off with the Hydrovac vacuum-water extraction system. Since each reaction process is followed by a washing process in wet finishing, 70% of the energy consumption is incurred during washing. For this reason, Benninger washing compartments are insulated so that up to 50% of the radiated energy can be saved here. The topic of the "internet of things" (IoT) is also becoming increasingly important in the textile machinery industry. 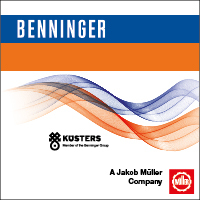 True to the principle "trust is good, control is better", the important operating parameters of the Benninger systems are continuously monitored in a closed control circuit. Deviations are detected and corrected immediately. Particularly quality-critical parameters are forwarded to those responsible by means of modern IoT technologies and an alarm is sounded in the event of limit value violations. “A good example of this is the central bearing lubrication on the Benninger Küsters Dyepad: The critical lever bearings of the padder are permanently lubricated, malfunctions are reported and the lubricant is automatically replenished,” the company explains.